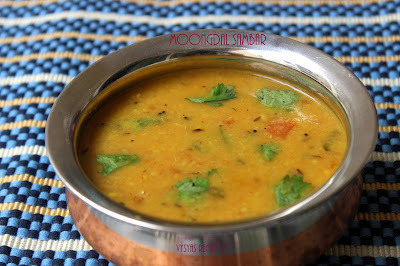 Moongdal Sambar is a healthy & Protein Rich Sambar Goes well with idli,Dosa & Pongal Recipe. It is prepared with Pesara Pappu or yellow Moongdal & little quantity of Toor dal. Yellow moong dal sambar is extremely light and easy to digest.Moongdal is good source of protein and dietary fiber.Moongdal is also rich in iron & pottasium. Today we will learn about comforting & protein rich sambar. Pressure cook Moong dal & toor dal with 2 cups of water for 3 whistles. When pressure subsides open the cooker & mash the dal till it turns mushy.keep it aside. Heat the oil, add mustard seeds. When mustard seeds splutters add cumin seeds. When cumin seeds sizzles add curry leaves,Red chillies & Green chillies. When chillies turns the colour, add Pearl Onions. When onions turns Golden brown colour add tomatoes. Saute till tomatoes turns mushy. Then add sambar powder & hing. Give a Quick mix. Now add cooked dal & water. ( i have added around 2 cups of water). Sambar consistency should be thin, so adjust water accordingly. let it boil for few minutes, till it gets light sambar consistency. if you want to add veggies like carrots or potatoes, chop it & pressure cook it along with dal , or you can cook seperately & add before adding cooked dal . Consistency of sambar should be thin for tiffin sambar. Adjust the chillies according to your taste. It pairs well with idli,dosa, pongal & also with chapathi's. Believe it or not, but your cooking style is very similar to ours. 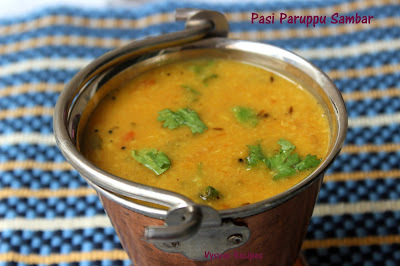 We do follow similar dal recipe except the addition of sambar masala powder... which sounds great to me.. Very good healthy share my dear friend👌👍. Love this sambar. Very yummy and great side for tiffins. Nothing can beat the taste of pearl onions naa..